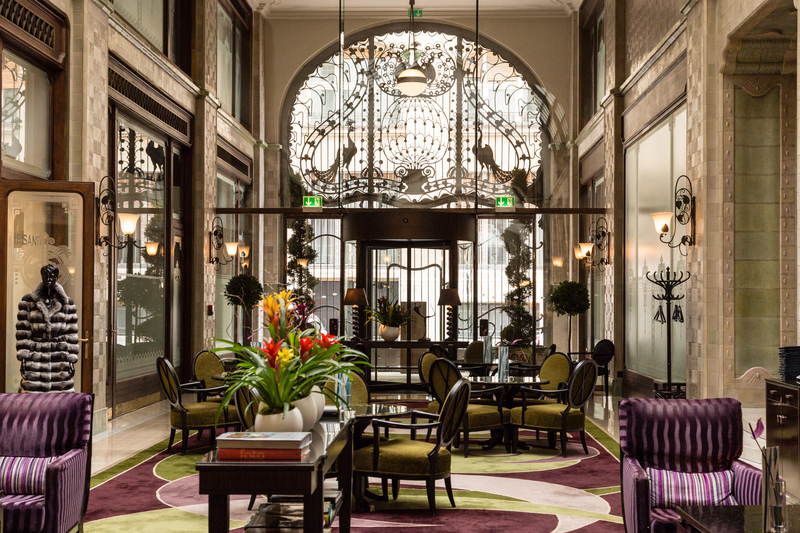 The Four Seasons Hotel Gresham Palace Budapest sits on fabled history almost as long as its name. The renovated historic venue along the Danube River was constructed from 1904-06 over the Nákó House, a neo-classical palace built in 1827. Visitors now wander the lobby, off Széchenyi Square, and experience the grandeur of old-time Budapest. The smart ones book a room. Originally, the palace served as an office building but was also a home for wealthy British aristocrats connected with the Gresham Company. Bombing of the nearby Chain Bridge during WWII caused great damage. After the war, Soviets occupied the city and soldiers took up residence in the quarters. The palace fell further into disrepair. 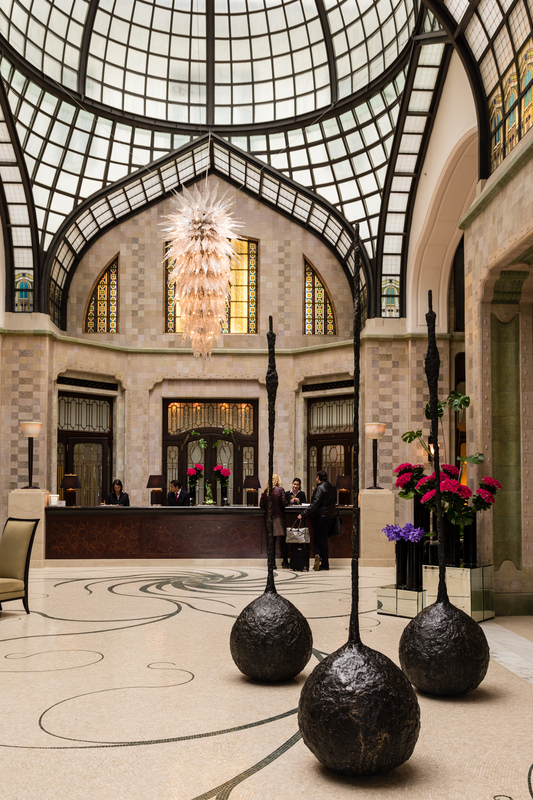 Today, you walk through the stunning wrought iron peacock gate, Páva Udvar or Peacock Passage, and indulge in Art Nouveau opulence. Pause among the iron works, including an aviary-like domed roof; mosaic floors created by laying 1,021,200 tiles; and colorful stained glass panes to appreciate the beauty. Sculptures and flowers delicately and skillfully placed complete the mesmerizing space. Iron work is featured in the Four Seasons Budapest lobby and Peacock Gate. Four Seasons Gresham Palace Atrium. 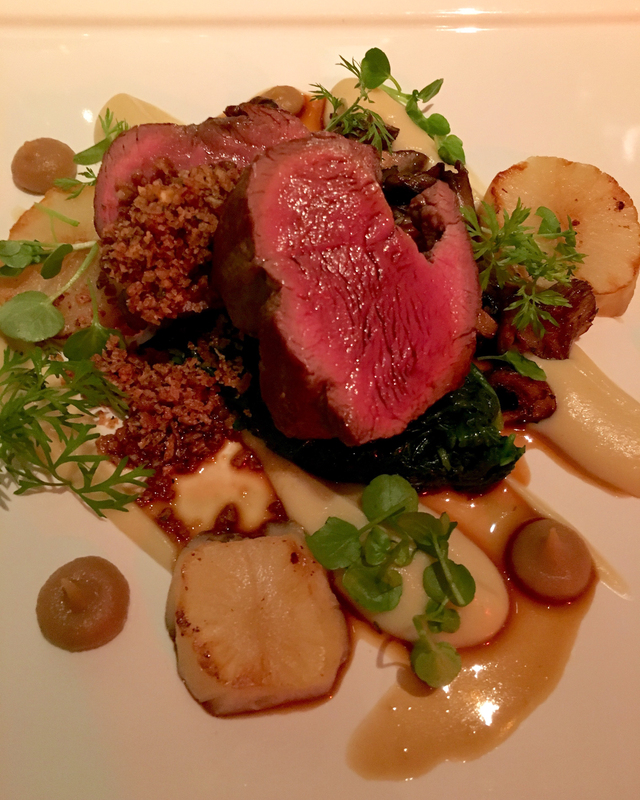 Dining presents another fine option for tourists, and my meal at the Kollázs Brasserie & Bar became a gastro-indulgent affair. Kollázs, by the way, means, “collage” in Hungarian, so the restaurants aims for creative combinations blending local and international flavors with traditional and modern dishes. When I entered the dining area, I found the restaurant décor surprisingly simple and warm compared to the lobby. The feel was that of a European bistro: tables close together, floor-to-ceiling windows, brass accents and comfortable leather chairs. Hungarians are passionate about music, and I recall the sound of classical music playing in the background. If the weather cooperates, choose the outdoor patio, which sadly was not an option for my dining partner and me. 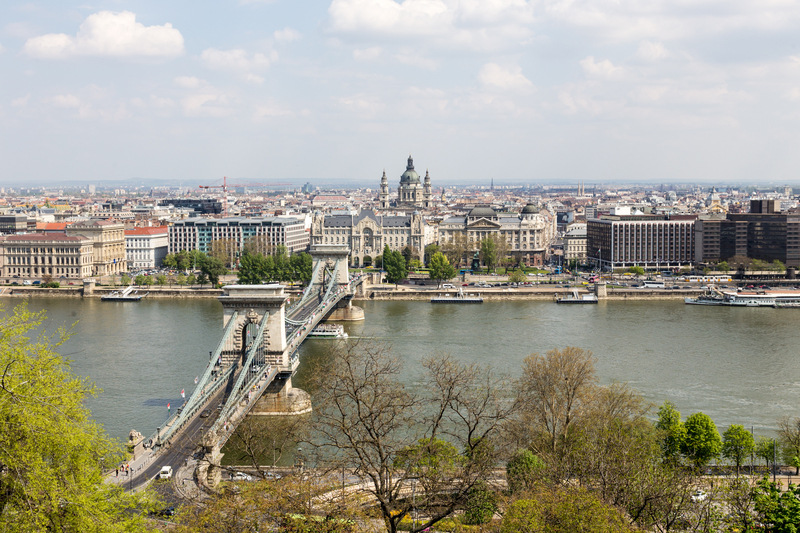 Here, diners relish one of Budapest’s best views: the famous Chain Bridge (officially named Szechenyi Lanchid) and other historic buildings on the opposite or Buda side of the river. After being seated, we were immediately handed the extensive cocktail menu and received some recommendations. I ordered the Turay Ida Martini in honor of the famous Hungarian actress, Ida Turay. (Hungarians say the last name first.) According to whispered secrets from our waiter, Ida was the last tenant at the Gresham during the time the building functioned as soviet apartments. 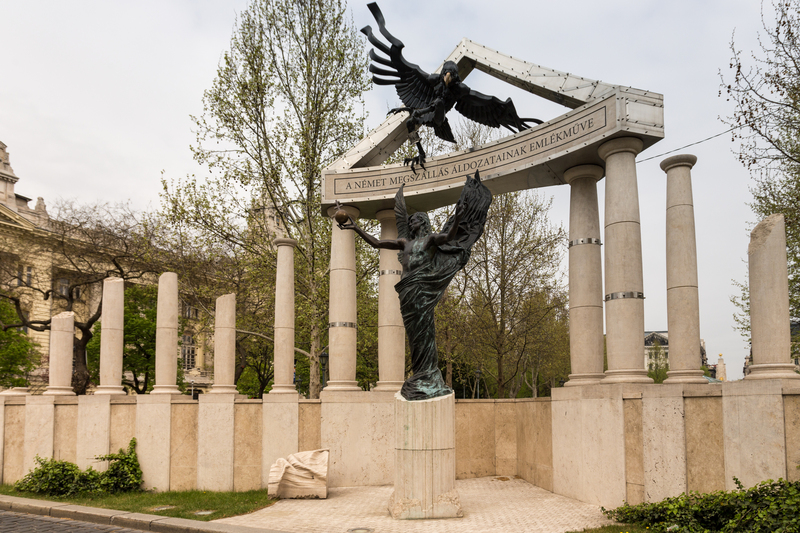 Although the aging, dilapidated structure was purchased in the 1990s and slated for restoration, construction didn’t begin until Ida no longer needed to be accommodated. Hint, hint – passed away. The Four Seasons spent over five years matching every piece of remaining decor to bring the palace back to its original glory. The doors officially reopened in June 2004. After sipping our martinis, we could not resist the temptation of escargots as an appetizer. Six scrumptious snails, nestled in their shells with classic butter and garlic, arrived tableside. We shared the impeccably prepared dish, to save room for our entrees. Multiple entree choices enticed but I chose veal tenderloin au jus. The meat arrived exuding a reddish-pink hue and was so tender I barely needed to use a knife. I had to force myself to eat slowly to fully savor the repast. My companion Judy’s cassoulet (a rich, slow-cooked casserole originating in the south of France, which usually contains pork, goose or duck and white beans) featured lamb instead. 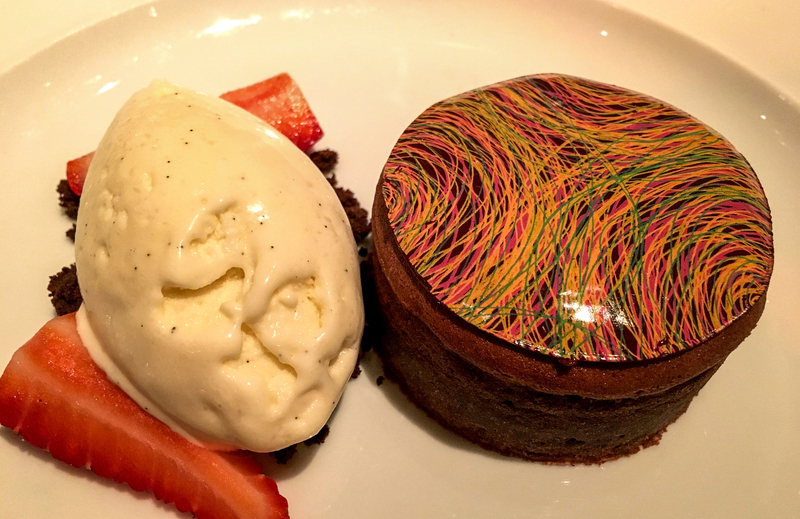 The dessert menu proposed a “simple” chocolate tart with vanilla ice cream, but the waiter won me over when he described it as a small chocolate lava cake. Well…it wasn’t simple; the pastry chef’s skills shone brightly with an exquisite and dainty design painted on the brownie-sized confection. The ice cream’s bite was not overly sweet, so didn’t diminish the intensity of the creamy chocolate. We shared this treat in the naïve and ever-hopeful quest to preserve our not-so-girlish figures. Once again, dining at the Four Seasons lived up to its outstanding reputation for impeccable quality and service. You won’t be disappointed. 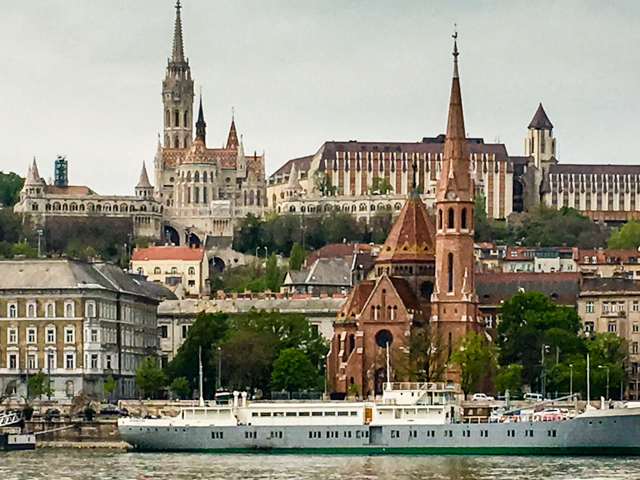 If you’ve never been to Budapest, allow for three to five days to explore the many fascinating historical and cultural venues the city offers. 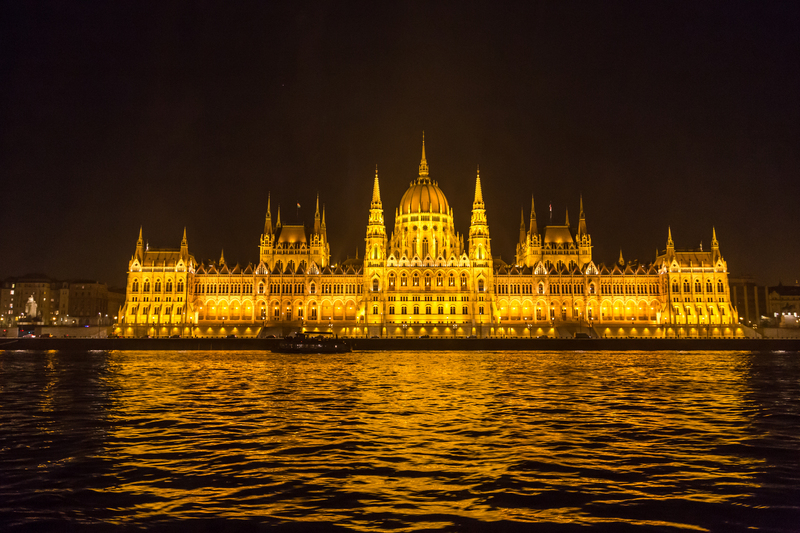 Parliament as seen on an evening river cruise. Disclosure: My trip to Hungary was self-funded; however, many thanks to the Four Seasons Budapest for providing this memorable meal.